What is the exact nature of the relationship between al-Qaeda and Hay'at Tahrir al-Sham (HTS)? HTS is a successor to Jabhat Fatah al-Sham, the rebranded version of Jabhat al-Nusra that was announced in July 2016 with a purported dropping of ties to al-Qaeda. There has been continual debate over questions such as whether the shift to Jabhat Fatah al-Sham constituted a genuine breaking of ties, and whether there was agreement from the central leadership regarding the matter. Or did the shift to HTS constitute the real break of ties if any? Recently, testimonies from multiple key figures on all sides of the debate have been released, apparently eager to settle their disputes over the Internet. It is the aim of this post and subsequent ones to translate this material for the reader's convenience and in a final post, try to put all the material together to understand what it means. To begin with, we will consider the testimony of the Jordanian jihadist jurist Sami al-Oraidi, who was once Jabhat al-Nusra's chief Shari'i official (i.e. dealing with religious matters for the group). His descriptions of the group's ideological program released through its media wing in 2013 were indicated by Jabhat al-Nusra leader Abu Muhammad al-Jowlani to be a reliable guide to the group's orientation. 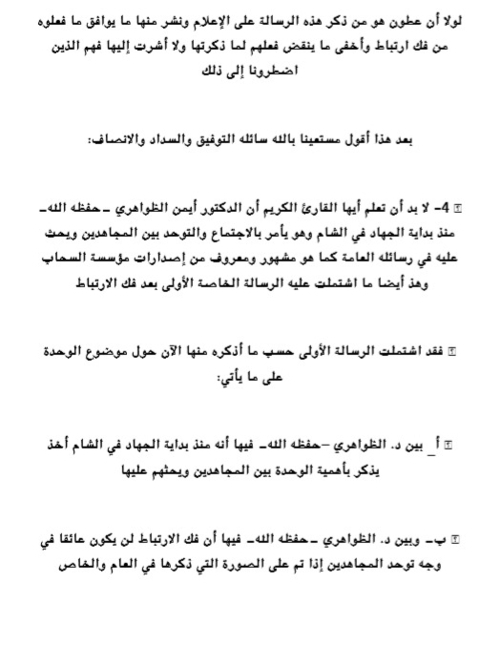 Oraidi appears to have remained in the organization following the shift to Jabhat Fatah al-Sham but broke off after the founding of Hay'at Tahrir al-Sham, hinting through postings and a treatise on bay'a (allegiance) that Hay'at Tahrir al-Sham had rebelled against al-Qaeda and broken its allegiance pledge to al-Qaeda's amir Ayman al-Zawahiri without proper consultation of Zawahiri. Oraidi eventually became more explicit in his criticisms, and offered his version of events behind the scenes in a series of posts in October 2017. This series came in response to leaked comments by HTS' Abd al-Rahim Atoun (Abu Abdullah al-Shami) on a speech of Zawahiri that had been released at the time. In that speech, Zawahiri commented on the nature of allegiance, affirming that it is binding by nature and cannot be violated. The implication seemed to be that Jabhat al-Nusra's successors had broken that pledge of allegiance. Abu Abdullah al-Shami has been the main leading figure in HTS who has defended the project intellectually and ideologically against al-Qaeda 'loyalists' like Oraidi. Indeed, it is said that Abu Abdullah al-Shami is particularly close to Abu Muhammad al-Jowlani, who was originally the military commander of HTS but has since succeeded ex-Ahrar al-Sham figure Hashim al-Sheikh as overall leader. Oraidi himself has since been arrested by Hay'at Tahrir al-Sham.
. He claims he is being forced to speak only so far as necessary to refute supposed errors and falsehoods of Abu Abdullah al-Shami.
. A distinction is made between the stage of Jabhat Fatah al-Sham and Hay'at Tahrir al-Sham: the latter is characterized as a wholesale break from al-Qaeda. 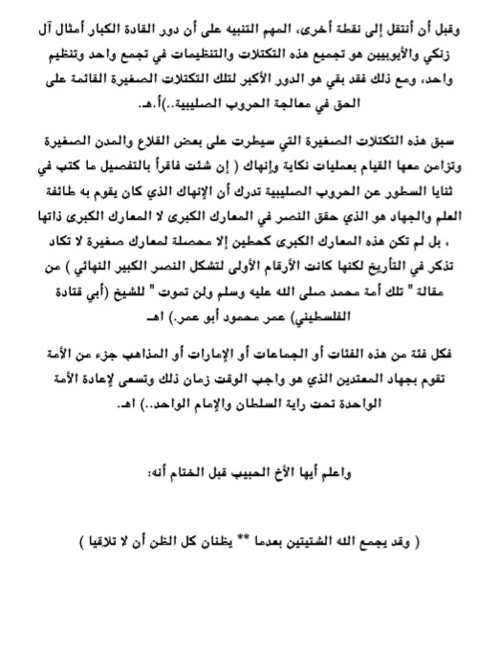 Not even Zawahiri's deputy in Syria, Abu al-Khayr al-Masri, was informed of the process of formation of the group. Jabhat Fatah al-Sham, however, is portrayed as only a media-image break from al-Qaeda. If Oraidi's testimony is to be believed, then the likes of Jowlani and Abu Abdullah al-Shami tried to convince the al-Qaeda 'loyalists' to go along with forming Jabhat Fatah al-Sham by arguing that it would only be an outward break from al-Qaeda, whereas connections would in reality be secretly maintained. This context does make sense for the initial wording of the announcement of Jabhat Fatah al-Sham as not being connected to an 'external entity'.
. Zawahiri nonetheless rejected Jabhat Fatah al-Sham some time after its formation in a private letter as there had not been appropriate consultation. He ordered it to return to its previous state and thus Abu al-Khayr al-Masri ceased to endorse the project.
. Oraidi portrays what has happened as an act of rebellion similar to the Islamic State's break from al-Qaeda. Below is the original text of Oraidi's October 2017 series, with translation as well as explanation of terms in square brackets where necessary. Series: for God, then for history. Concerning the breaking of the connection between Jabhat al-Nusra and the al-Qa'ida organization. The former general Shari'i official for Jabhat al-Nusra and a member of the Shari'i committee in Jabhat Fatah al-Sham. I begin by God's permission the series of witness testimonies for God then for history concerning the breaking of ties of Jabhat al-Nusra (Fatah al-Sham) with the al-Qaeda organization. We had kept silent in what came to pass as we did not speak of it to protect the interest of the field and in service to more important matters and other reasons. 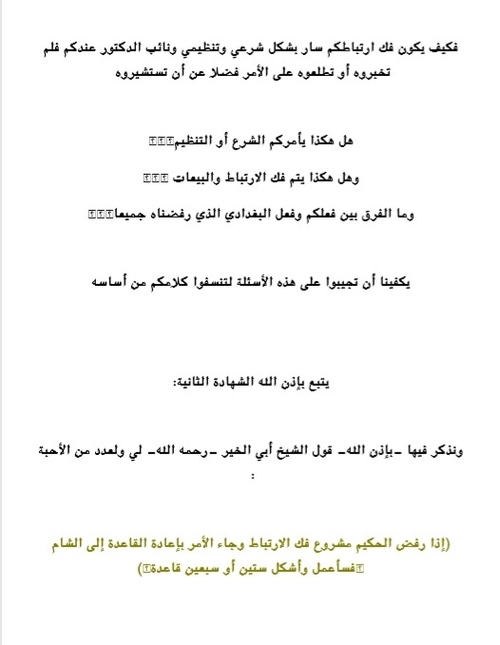 But today after what spread and circulated privately and publicly from the words of Sheikh Abu Abdullah al-Shami (Abd al-Rahim Atoun) concerning this situation in the context of his commentary and response to the last speech of Dr. Ayman al-Zawahiri (may God protect him)- 'We will fight you until there is no more fitna by God's permission'- and the errors and falsehoods this response and commentary contained, I considered after seeking the guidance and counsel of some of those dear to me to write some witness testimonies concerning the issue of the breaking of ties in order to exonerate blame and show some facts and make clear what are the errors and falsehoods. We ask God for success and the right path. Sheikh Abu Abdullah al-Shami in his words fell on their path: that is, they do what they condemn others for doing in terms of exposing secrets and betraying the trusts of the councils so beware of that- I speak of the path of such people [i.e. hypocrites]. In so far as we mention facts, we will embrace in it by God's permission the manners of Islam in discussion and responding to errors. 1. Sheikh Abu al-Khayr- may God have mercy on him- did not know of the formation of HTS (the wholesale breaking of ties) except more than two weeks after its formation. For I and a number of brothers- among them the brother [Abu] al-Qassam- went to him around a week after the announcement of the formation of HTS so we asked him about the means of forming the commission, how it was formed, whether he knew about it, and whether Dr. Ayman- may God protect him- agreed to the wholesale breaking of ties and similar such questions. So how can it be that the breaking of your ties proceeded in a Shari'i and organizational matter when the doctor's deputy among you was not informed by you or made aware by you of the matter, let alone seeking his counsel? Does thus the law or organization command you? And are thus the ties and allegiance pledges broken? And what is the difference between what you did and what al-Baghdadi did, which we rejected entirely? It suffices for us that you respond to these questions so that you can blow away your words from their foundation. The second testimonial will follow by God's permission. So wait for us by God's permission. This beginning began in following the example of the manhaj [program] of many of the 'ulama in what they wrote on refuting doubts and falsehoods in that they would respond to falsehoods beginning with what refers to nullifying them from their basis. Then they would rely on detailed explanation when they wanted to expand and explore in detail in responding. 2. It is necessary for you, dear reader, to know that some time after Jabhat Fatah al-Sham was formed, the first message from Dr. Zawahiri- may God protect him- came and the response from him began with the rejection of the project and demanding a return to the previous situation before the announcement of Jabhat Fatah al-Sham and he- may God protect him- clarified that what happened in it was a violation and act of disobedience [/rebellion]. Of course Atoun referred to this message in his response and commentary and did not mention the hakim's description of what they did as an act of disobedience. And it was what Atoun concealed from that message: that the hakim had made clear in that message that the separation of any branch of the organization requires Shura [consultation] in the organization. For this matter is not among the competencies of the general amir himself, let alone the competencies of the deputy, but rather the issue is an issue of Shura. This is what I mention now from the message. And here I must point out that were it not for the fact that Atoun mentioned this message and revealed some of the details in it and concealed some of the important details I would not have mentioned it or revealed it, but it is he who mentioned it in the beginning, so it has become necessary to make clear what he know from the reality of the situation. And the important matter that Atoun did not mention in his response and commentary on the speech of the hakim- may God protect him- and which it is necessary to mention and make clear is that Sheikh Abu al-Khayr- may God accept him- after this message of the hakim and what came with it from the clarifying of his competencies, ceased to bless or affirm the continuation of the matter (breaking ties) until it should be referred to the hakim and the response should come to him from Dr. Zawahiri- may God protect him- in that for the hakim had clarified to him that this matter is not among his competencies as I mentioned previously. And similarly was I informed of it by one of the senior Shari'i officials in the commission. And also a number of the brothers heard this stance of Sheikh Abu al-Khayr from him. The general amir for the organizaton- Dr. Ayman al-Zawahiri- may God protect him- rejects the project. The first deputy (Sheikh Abu al-Khayr)- may God have mercy on him- ceased to continue with the project without the agreement of Dr. Ayman al-Zawahiri- may God protect him. The second deputy rejects the project. The third deputy rejects the project. Atoun in his response and commentary acknowledged what I mentioned regarding the position of the general amir and the second and third deputies but concealed the position of Abu al-Khayr- may God have mercy on him- from whom I heard it myself and more than one of the brothers heard it so I don't know why he neglected it. Is this thing you did that which the law or organization commands you? It suffices for you to respond to these questions to blow out your words from their basis. 'If the hakim's order comes to reject the project of breaking ties and the order comes to restore al-Qaeda to al-Sham, what is the position? And the third testimony will follow by God's permission. 3. What must be mentioned and affirmed in this regard so that the picture becomes abundantly clear to all who desire the truth is that Sheikh Abu al-Khayr and Sheikh Abu al-Faraj- may God sanctify their two souls- and Sheikh Jowlani and Sheikh Atoun had made themselves comply in some of the meetings that if the order of Dr. Zawahiri- may God protect him- comes to reject the breaking of ties, they should hear and obey. And for you is an affirmation of that in the general sense. As for Sheikh Abu al-Khayr- may God have mercy on him- we have made that clear in the preceding testimony. Even if there is something besides that in the pipe, we nonetheless suffice in what we have mentioned, for our purpose is to show the facts in the general sense unless we are compelled to clarify further. As for Sheikh Abu al-Faraj- may God have mercy on him- he met with some of the brothers after the announcement of Fatah al-Sham to calm the situation and a long discussion occurred among them and during the discussion they asked him if the hakim's response comes to reject the project of breaking ties what should the stance be. He said: All are to hear and obey. No discussion. What must be mentioned regarding the position of Abu al-Faraj- may God have mercy on him- is that the last session he held less than an hour before he was killed was with some of the leadership of the organization here to consider how to get out of this problem that had resulted from the breaking of ties without referring to the general leadership with the obligation of complying with Dr. Zawahiri's directorates. And this session was after the hakim rejected the project of breaking of ties and considered it an act of disobedience, so the session was never to reject and rebuff the hakim's order as per the testimony of Sheikh Abu al-Qassam- Zarqawi's deputy- who was present in that session. And this is what I know personally regarding Sheikh Abu al-Faraj's position concerning this matter through the discussion he and I had regarding this matter. 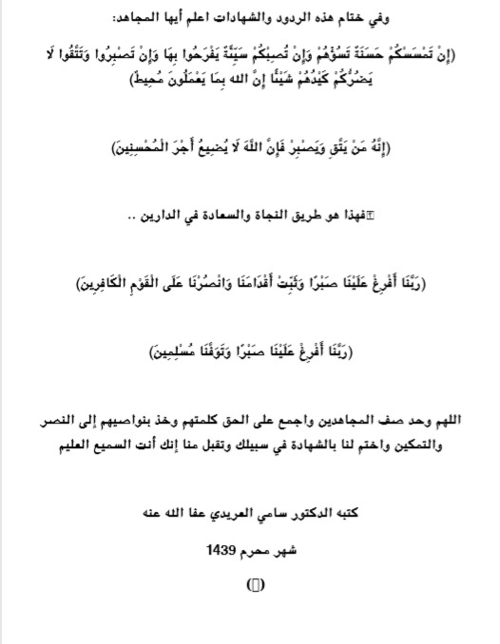 And what has been previously affirmed and mentioned regarding the position of Sheikh Abu al-Faraj- may God have mercy on him- nullifies and shows to be false what Atoun mentioned and attributed to him in his response and commentary. And that was in every session in the presence of a number of the brothers. And I asked Jowlani after the hakim's response to reject the project: oh sheikh, did you not embrace for yourself in front of some of the brothers to hear and obey the hakim if he rejects the project? So where is the hearing and obeying? So he began invoking the interest of the field and similar talk as justification. I suffice to this extent of discussion regarding what Sheikh Jowlani and Atoun embraced for themselves in the event of Dr. Ayman- may God protect him- rejecting this project. And I ask not to be compelled to clarify more, for it is not my aim from this response to defame, prod, slander and attack in a hidden manner as was contained in the speech of Atoun in his response and commentary, but my intention is to make clear what we see in truth in the fewest pictures and means and were it not for the fact that the group is the one that compelled us to that, we would not have spoken, for we embraced silence during the past time in service to the more important issues. Were it not for what Atoun mentioned in his response and commentary from errors and falsehoods and distorted matters, I would not have spoken, as I made clear in the introduction. And here I must remind you that it is because of your previous compliance and your words with it: that it is a media breaking of ties as Atoun himself mentioned in his response and commentary: it is because of this that many of the brothers initially agreed with you on the project just as it is not hidden to you or those besides you, and this is what explains for us these relations that Atoun mentioned in his speech. And perhaps we will come to explain that further in what follows by God's permission. Is it not from Shari'i and organizational obligation that you must comply with what you embraced yourselves to comply as Sheikh Abu al-Khayr- may God have mercy on him- did, so you should not overstep the opinion of the general leadership? In what you have done, have you not resembled that for which we entirely condemned Baghdadi and Adnani, so what is the difference between what you did and what they did? Are thus ties broken and pledges of allegiance annulled? The fourth testimony will follow by God's permission and it is the most important of the testimonies. In it we will make clear by God's permission the falsehood of what Atoun pointed to regarding the difference of the words of Dr. Ayman al-Zawahiri- may God protect him- in public and private messages. The leadership of the al-Qaeda organization advised the jihadi groups in al-Sham in public messages and the first private messages that came from Dr. Ayman- may God protect him- to unite and come together. For these messages never contradicted the public messages as is understood from Atoun's presentation in his response and commentary on the last speech of Dr. Ayman. And this is one of the facts relating to Atoun's words in deficiency and their refutation from their basis as we will make clear by God's permission. Were it not for the fact that Atoun is the one who mentioned this message in the media and published from it that which agrees with what they did concerning the breaking of ties and concealed that which nullifies what they did, I would not have mentioned it or pointed to it, for these are the ones who compelled us to that. 4. It is necessary for you to know, dear reader, that Dr. Ayman al-Zawahiri- may God protect him- had ordered for coming together and unity among the mujahideen since the beginning of the jihad in al-Sham, and had been urging that in his public messages, as is well known and publicized from the releases of al-Sahab foundation, and this is also what the first private message contained after the breaking of ties. a) Dr. Zawahiri- may God protect him- clarified in it that from the beginning of jihad he had begun mentioning the importance of unity among the mujahideen and urging them to do so. b) Dr. Zawahiri- may God protect him- clarified in it that the breaking of ties will not be an impediment in the face of unity of the mujahideen if done in the form he mentioned in public and private. c) And this form is: if they establish a rightly-guided Islamic government or a general union of the mujahideen were established in al-Sham. Note, brother, this important bit- 'in al-Sham'- and not in Idlib or its environs and a general union, not a union with some and not others. d) And he- may God protect him- made clear that if this rightly-guided government or general unity were realized al-Sham and not Idlib or its environs, and not a unity of a number while a number refrained: if that were realized on the ground in truth, the organizational ties will not be an obstacle in the face of that. e) And he made clear that the breaking of ties should not be before the arising and presence of this rightly-guided Islamic government or the undertaking and formation of this general unity on the ground in the land of al-Sham, not Idlib or its environs. So the breaking of ties before that is a violation of the amir's orders and directives, and in that is an act of disobedience against the amir as Dr. Zawahiri described the breaking of ties and announcing of Fatah al-Sham in the message as an act of disobedience. f) And he- may God protect him- made clear in it that the separation of any branch from the organization is not among the competencies of the general amir let alone the competencies of his deputy or the branch itself. For this is among the matters that are to be referred to broader Shura. This is what I have been compelled to mention from what I know and remember from that message to make clear the falsehood of what is understood from the words of Atoun that the hakim's directives in that message contrast with his method in ordering for unity in the public messages. And this generalized statement by God's permission blows away what Atoun outlined in his response and commentary on Dr. Zawahiri from its foundation and has made clear to us that what Jowlani and those with him did annulled the pacts and violated the leadership's directives an was an act of rebellion against the amir and not on the Shari'i or organizational path as Atoun mentioned. But rather it is an act of disobedience in Shari'i terms and an organizational violation that they must repent from entirely. The reality we have lived through has proven the honesty and wisdom of the doctor and those around him- may God protect them- in that matter. It was rather imperative upon Sheikh Atoun to be fair in so far as he divulged the message that he should mention the directives of the hakim- may God protect him- in it entirely so he should not conceal and find strange the order the hakim mentioned in the message clearly and explicitly. For the hakim ordered you to merge and unite and he did not suffice with that alone but rather he made clear to you the path and appropriate timing but rather you rebelled and contravened the matter then you began to blame the amir and the organization but the priority for you is to blame yourselves and God is the One whose help is to be sought. And I in truth am most surprised about the deeds and words of Atoun here just as I was surprised at him in the first issue above. Sheikh Abu al-Khayr- may God have mercy on him- summoned me on one of the days and after a long conversation concerning the hakim's first messages he gave me a USB and told me that in this USB is a part of the hakim's message to him and it is the part concerning the inquiry of the issue of the organization's allegiance to Mullah Omar and Mullah Akhtar- may God have mercy on them- as a general allegiance for we had asked Sheikh Abu al-Khayr- may God have mercy on him- to inquire for us about this matter so he did and the response came. And Sheikh Abu al-Khayr- may God have mercy on him- informed me that he had handed over and given Sheikh Atoun a copy of this response. So I don't know why Atoun relies on stirring up these words after that? And why did he mention it without making clear that the hakim had responded to this inquiry? Or is it a clear act of disobedience and organizational violation that you must entirely repent from? And are thus ties broken and allegiance pledges dissolved or is that it is trickery to be rid of this matter? And what is the difference between this thing you did and what Baghdadi and Adnani did? By God's permission the fifth testimony will follow in which we will mention important words of Sheikh Atoun that blow away his response and commentary from its foundation by God's permission. This is the fifth testimony on the subject of the breaking of ties of Jabhat al-Nusra (Fatah al-Sham) with the al-Qaeda organization. I ask that it be the last, and I will mention in it two important issues by God's permission that invalidate the words of Sheikh Atoun in his response to the last speech of Dr. Ayman al-Zawahiri- by God's permission- and I will mention at the end of it a conclusion in which there is advice in God. Sheikh Abd al-Rahim Atoun in his written and heard speeches and ordinary discussion sessions frequently talked about the issue of the importance of connection with the al-Qaeda organization and importance of allegiance and the obligation of fulfilling it and the prohibition on breaking it. This matter is that which invalidates and blows away his words and flimsy justifications in his response and commentary on the last speech of Dr. Ayman al-Zawahiri- may God protect him. 'As for us, our connection with the Tanzim Qaedat al-Jihad group is an expression of a Shari'i allegiance pledge on our necks to wage jihad in the path of God- Exalted and Almighty is He- for this group. And we consider this to be a part of our jihad in the path of God Almighty under the umbrella of the one group and before we hear of all that, and it is in our striving that we entrust God Almighty that He should realize Shari'i interests and political interests for us, the people of al-Sham and the Muslims generally, as God- Exalted and Almighty is He- has urged us to unity. And if our enemy fights us globally, we must at least as well a connection with the rest of our brothers who are waging jihad in the other fields as the enemy is one. Iran is fighting us in Yemen, and is fighting us in Iraq, and is fighting us in Lebanon, and in al-Sham, and the Americans are likewise doing so. So our enemy is broader than just our limiting it to Bashar al-Assad and his group. And we said many times that the Qaedat al-Jihad organization represents an organization and we are affiliated with it, and we said more than once and before us Dr. Ayman al-Zawahiri- may God protect him- said: when the people of al-Sham in their revolution reach the stage of establishing an Islamic state or Islamic government, our organization will not depart from this general context under what the people of al-Sham agree in establishing an Islamic state or Islamic government calling for the rule of Shari'a, arising on the basis of Shura and spreading justice, and this is what we have said many times and repeatedly. Perhaps some understood from us that if we reach this stage and this organization whose name is Jabhat al-Nusra melts into this state: that this is a call from now to break ties. But we have not yet reached this stage, and we have told some of the factions of those who insist on the issue that we do not see a Shari'i interest in breaking off from the Qaedat al-Jihad group at this stage and our connection with it is not a utilitarian connection as some characterize us through it, but rather it is a Shari'i connection, meaning we perceive that it is obligatory on our necks that we fulfil this allegiance that we have pledged. And also we do not consider our allegiance to the Qaedat al-Jihad organization as fundamentally in opposition to the interests of the people of al-Sham, the revolution of the people of al-Sham and the Muslims in al-Sham and elsewhere besides al-Sham. Mursi was not Qaeda, and he offered all concessions and despite that they devised a conspiracy against him and deposed him. Saddam Hussein was likewise not Qaeda, and despite that when he contravened the plans that America set out, they fabricated some things and then overthrew him. So the intention from that: our connection with the Qaedat al-Jihad group is an obligatory Shari'i allegiance on our necks until we reach the stage of establishing an Islamic state or government whereby it is natural that all groups should be dissolved into something bigger as Sheikh Osama- may God have mercy on him- said: 'The interest of the state is preferred over the interest of the group, and the interest of the Ummah is preferred over the interest of the state.' And all the factions that demanded this from us, we discussed with them at length the fact that we do not see a Shari'i interest in this stage to break links with the Qaedat al-Jihad group. Then why all this noise about the issue of al-Qaeda and breaking our ties with al-Qaeda? We are a Qaeda organization: Jabhat al-Nusra is a Qaeda organization. It is one of the branches of the global Qaedat al-Jihad organization. And since we began by the grace of God- Exalted and Almighty is He- to reckon that we have not fallen short in defending our people the Ahl al-Sunna wa al-Jama'at [Sunnis] in al-Sham, so Jabhat al-Nusra is by the grace of God- Exalted and Almighty is He- a strong military arm for Ahl al-Sunna in al-Sham, and offers to the Ahl al-Sunna as far as it can and in accordance with the circumstances of the war services of water, electricity, flour and the like. As we offer to the people what we can offer from security through the courts and judiciaries, we work with many of the factions militarily and in services and the like, so what we do in al-Sham is the manhaj of the al-Qaeda organization in a general sense, so why this insistence on us to break our ties with the Qaedat al-Jihad organization? We will not change, whether we break our ties or not. This is who we are. 'The state group [Islamic State] uses lies and deceit as a means of trying to prove the soundness of its manhaj and preserve its state by any means possible. For the state group has dealt fraudulently in the nature of its relations with the general leadership and has played around with it according to interest. For before the response came, they would say and promote in front of their members and Jabhat al-Nusra's members that they would immediately subject themselves to the decision of Sheikh Ayman as he is their amir and al-Baghdadi affirmed to us that he had on his neck an allegiance to Sheikh Osama- may God accept him- an after he was killed he sent a message renewing the allegiance to Sheikh Ayman- may God protect him- and on this basis Sheikh Jowlani gave allegiance and was recruited by Abu Bakr al-Baghdadi, then the state spread the suspicion that 'an amir gave orders and a soldier rebelled' to their soldiers to attack and slander the leadership of Jabhat al-Nusra to facilitate for them the stealing of all the financial and armed assets of the Jabha [Jabhat al-Nusra]. And when the decision message came, the Dawla concealed the message again and issued an internal statement denying their knowledge of the arrival of the message and declaring it to be false. 'I call the curse down on you as the liar on the basis that we referred the matter to Sheikh Zawahiri- may God protect him- and we were pleased with it in ruling and judging, and it was repeated to us from your words that you were pleased with it likewise, and those who showed their contentment with this matter were Sheikh Baghdadi, his deputy Anbari and you, and the Shari'i Abu Bakr al-Qahtani and the Shari'i Abu Anas al-Iraqi: this at least. 'The seventh point: the technical term breaking ties. The nature of ties between us and the Qaedat al-Jihad organization is a confirmed allegiance on our necks to hear and obey Sheikh Zawahiri- may God protect him: an allegiance to realize the objectives of jihad, and this allegiance is an obligation to fulfil and it is not allowed for us by law not to fulfil it or dissolve it so long as a Shari'i necessity requiring that does not arise. If we do so without undertaking that necessity, on our necks is sin according to the magnitude of that sin in violating the allegiance and annulling the pact. I suffice in these transmissions from the words of Sheikh Abu Abdullah al-Shami (Abd al-Rahim Atoun) even if there are many others like them, for these words of Sheikh Atoun suffice to blow away and demonstrate the falsehood of what he outlined with his hand recently in his response and commentary on the speech 'We will fight you until there is no more fitna by God's permission' of Dr. Zawahiri- may God protect him. And I have confined myself to transmissions from the official speeches because they do not bind Atoun alone but rather ever brother from the brothers who have an allegiance to al-Qaeda on their necks in the Jabha, for they are speeches from official released that represent the group at the time. And I will not mention here what went on in ordinary discussion sessions for it is numerous as you know and I request not to be compelled to mention them in the coming days. So after this statement, may you, Sheikh Atoun and those around you who broke their allegiance, accept that your interpretation mentioned above should come down upon you. For you on your interpretation disobeyed the amir and broke the allegiance without a Shari'i justification. And by your words: on your necks is sin according to the magnitude of that sin in violating the allegiance and annulling the pact. And on the basis of your words, you have resembled in these actions of yours what you condemned Baghdadi, Adnani and their group for doing. Then you come after these transmissions to justify your act of disobedience and violation of the allegiance with that is not accepted in law, reason or organizationally as you explained, made clear and taught your followers. May God guide us and you for what He loves, is pleased with and God is the One whose help is to be sought. The one who splits the group and gathering as it was holding together, and split the ranks as it was one, and broke the edifice as it was a strong stack, and the one who broke the allegiance and pledge even as he considered fulfilling it an obligation, and the one who has been deceived by the conspiracies of the West and East even as he was warning of them. And this is what has resulted in these calamities, for the ranks have been separated, the gathering has dispersed, and the edifice has been broken. How should there be blame and censure against the one who adhered to his allegiance and fulfilled his pact and did not separate the gathering and was not deceived by the conspiracies of the east and west? He who adhered to the implanting of the divinely-inspired leaders, among whom is he who fulfilled his vow and he who awaits his chance, and they did not seek to alter anything. They are those whom God blessed with wisdom and steadfastness, so he did not violate their directives as he sees what happened to those who violate them and their directives. How should there be blame and censure against the one who defended this blessed call, its people, and its 'ulama: this blessed call that we reckon- and we do not vouch for it over God- as one of the vanguards of victory and tamkin [establishment of control]- by God's permission- and he sees the campaigns to slander and bring it down as well as its sheikhs and symbols? So reconsider- oh blamer and censurer- perhaps you will find we have an excuse in what we have done and written out of necessity. The second issue: defending our sheikhs, leaders and brothers whom Sheikh Abd al-Rahim Atoun defamed, slandered and attacked in his response and commentary. "Two bad characters, oh Sheikh Abd al-Rahim Atoun." I will not prolong discussion of this matter as Sheikh Abu al-Qassam- may God protect him- wrote on the matter. He made a statement and did well, so may God reward him best for what his hands outlined in defending our sheikhs and brothers. First point: Oh Abu Abdullah al-Shami (Abd al-Rahim Atoun) have you not abandoned our sheikhs and amirs? This hadith in which the former general Shari'i official for the Jabha outlined a message to defend the Jabhat's leadership, have you not remembered it, you and those around you, before you write these speeches? May God guide us and you. The second point: it is defending the brothers in the connections division and I will not labour this point for long for Sheikh Abu al-Qassam made a statement and did well in the statement of it also, but I add an important point that Sheikh Abu al-Qassam did not mention. The issue of the message that Atoun pointed out in his words and because of which he attacked the brothers in the connection department did not spread through the connection department- and God knows best. For news of the message's arrival spread on the Jabha's receipt of it. For the message arrived and remained with the leadership as you know oh Sheikh Atoun for more than a week and no one in that time reviewed its contents except the very narrow directorate and in this time- i.e. after you received the message- the news began to spread about the arrival of a message in response to the project of breaking of ties without know what the message contained. I remind you Atoun of this position in a condensed and summarised form because perhaps you forgot, so this position should remind you of what you forgot. Don't you remember oh Sheikh Atoun when we met with Sheikh Jowlani more than a week after you received the message? For I told Sheikh Jowlani: oh sheikh, indeed the matter of the arrival of the message from the hakim is spreading such that it has Deraa and Ghouta, so we want to know what is in it....etc. with the event. I suffice to this extent from the event as perhaps you remember the rest of it, for you know that the news of the arrival of the message spread after you received it and what its contents were had spread after Sheikh Jowlani made clear in many long discussion sessions concerning the message such that news of it reached the media, and I ask again that I not be compelled to go into further detail than that. As you know, oh Sheikh Atoun, the field of al-Sham has been afflicted with the phenomenon of media competition (#thephenomenonofAbuBreaking) and the phenomenon of the one who knows everything (#thephenomenonofAbualUrayf). So this is the reason for the spreading of news of the message after its arrival and the reason for the spreading of its contents after the discussions we remind you of and make clear to you in defence of brothers to us who arise on a great front- may God accept their efforts and jihad from them and protect them. 'Is this deeds of yours by which you broke the allegiance in media only (the stage of Jabhat Fatah al-Sham) first then in truth and reality (the stage of Hay'at Tahrir al-Sham) second- as Atoun mentioned in his essay- is this what the law or organization commands you to do? Or is it an act of disobedience and sin binding on your necks as you were interpreting and teaching your followers and responding to those who contravened you? And is it by the likes of these deeds of yours that ties are broken and allegiances dissolved? Or is it reprehensible trickery to escape from and be rid of this obligation as you described it? And what is the difference between this deeds of yours and the deed of Baghdadi, Anbari and Adnani, whom you condemned, disparaged and blamed? It suffices for you return and remember your prior words and interpretations on this matter some of which has been mentioned here, and think about responding to these questions to blow away what you did and wrote on it from its foundation- and God is the One whose help is to be sought- and I will not go on. I suffice to this extent from clarifying about the issue of the breaking of ties of Jabhat al-Nusra (Fatah al-Sham) with the Qaedat al-Jihad organization so I reckon that the matter does not need further detailing, and I reckon that the truth of the matter has become clear to many of those to whom it was concealed, otherwise the talk about that continues to be long. The intention is not to talk merely to talk but rather to make clear what we have been compelled to make clear. For we kept silent and held our tongue during the past time in obedience to God and in service to what is more important, and we were content to respond according to need and we spoke today in obedience to God and we have explained in detailed according to the extent of need and necessity. For we confined ourselves to what refutes the falsehoods and revealed and makes clear the errors, so there were a response and testimony according to need as the one who reviews the proceedings and events knows. And we did not go to the point of refuting what came in Sheikh Atoun's essay in detail for had we done do the matter would have needed to be multiplied fourfold of what we wrote. I here advise myself and my brothers in God entirely to unite efforts even if directions and opinions differ to repel the aggression of the enemies of the religion. For it is among the greatest and most necessary obligations in this critical time of the age of the Islamic Ummah, and if they are compelled despite that to clarify an issue or expose a suspicion it is such that they must confine themselves to the extent of need, for the global kufr has plotted to target all and spares no one as is not hidden from you, for they are going on that path with evil and cunning by night and day. We ask God to turn their schemes on them to rout them and that their evil should suffice the Muslims. First state of affairs: that the Ummah should have an imam and authority to lead it by God's law for here the Ummah entirely in its different doctrinal and jurisprudence madhhabs can participate under his banner and embrace his command the command of his deputies in what is right in jihad against the enemy attacking the Ummah, and this issue is clear and does not need much detail and explanation. 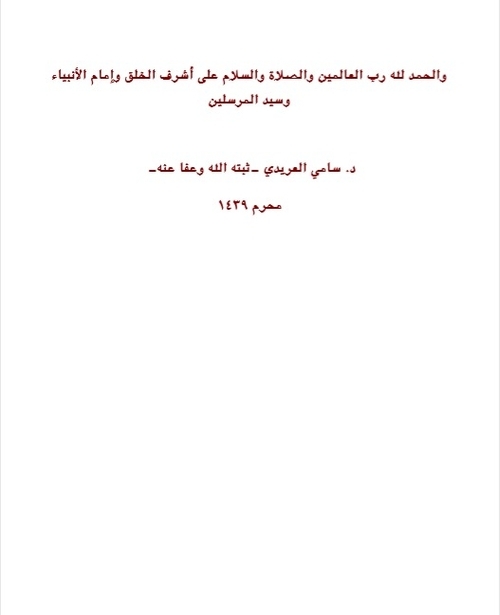 'The majority of those who have spoken of this particular time have dealt with it from the angle of some of the personalities who had an impact of bringing together the scattered efforts preceding their deeds, for we see a book dealing with it from the angle of the leader Nour al-Din Zinki, or the angle of the leader Salah al-Din al-Ayubi and so on...so the reader without knowledge thinks that this part of Islamic history in dealing with the Crusaders was done through the state bringing together the affairs of the Muslims, and this is a clear mistake, for the reader who becomes acquainted with that particular time will see that the Muslims dealt with the matter of the Crusaders through small gatherings, and scattered and spread out organizations, for this is a fort that was ruled by one of the families, under whose command it brought together a sect of the people, and this is a village where they were content with the rule of a wise leader among them, and they waged jihad with him, and this wise man organized with him a group of his students and they were content with his imamate and likewise, and perhaps the best who explains to us these matters in their true form is the book al-Itibar by the amir Osama bin Munqidh, and this Osama was from Shayzar fortress, and his family was the Munqidh family who were rulers of this fortress, and they have an attested role in the Crusader Wars, and Osama was an eye witness to the Muslims' wars against the Crusaders. And before I move to another point, the important thing to note is that the role of great leaders of the likes of the Zinki family and the Ayubis was to bring together these blocks and organizations into one grouping and organization, and despite that, the greater role remained for those small blocks arising on truth in dealing with the Crusader wars. And know dear reader before the conclusion that: God may bring together two dispersed people even after they wholly think that they will not meet. So this is the path of deliverance and happiness in the two abodes. Oh God, unite the ranks of the mujahideen, and bring their power together on truth, and bring their affairs to victory and tamkin, and conclude for us with martyrdom in Your path and accept from us: indeed You are the hearing, the knowing. Written by Dr. Sami al-Oraidi (may God forgive him) in the month of Muharram 1439 AH. And praise be to God the Lord of the Worlds and prayers and peace be upon the most noble of creation and the imam of the prophets and sayyid of those sent. Dr. Sami al-Oraidi: may God strengthen him and forgive him.